The Seattle company has made a start. But the challenge is enormous, with few immediate monetary incentives in place for change. When I was a little boy, my friends and I made extra cash by collecting empty soda pop bottles and redeeming them at the store for something like two cents. Enough bottles and I had some walking-around money. The bottles were sent back to the bottler, sterilized, refilled and put back in the markets and Coke machines. It was the future, he said. Indeed, from 1950 to 2016, world plastics production rose from 1.5 million tons to 335 million tons, affecting vast categories of packaging and products. Among them, in most states, were soft-drink bottles. When Mr. McGuire spoke those words, few were thinking about the environmental disaster this miracle material would cause. Starbucks has pledged to eliminate plastic straws by 2020. As the largest food and beverage retailer yet to make this move, the decision is more than symbolism. The company uses a billion plastic straws a year. It might influence other companies to do the same. 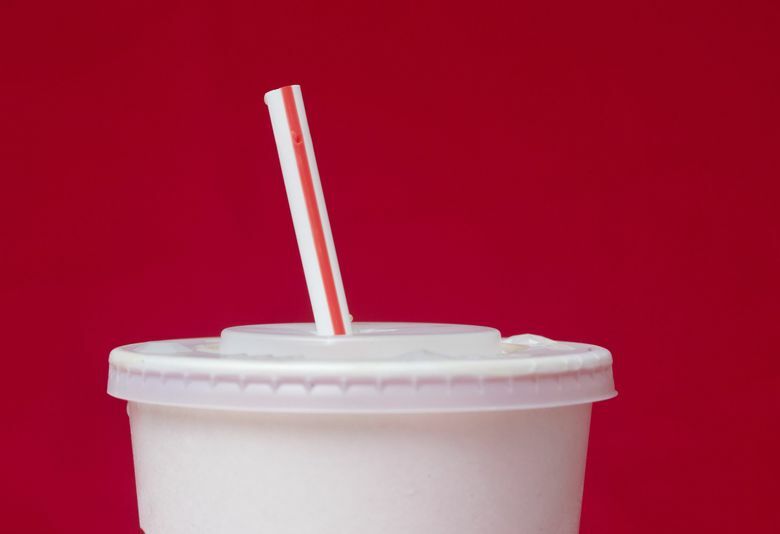 Alaska Airlines and McDonald’s are among those already trying to reduce the use of straws. (Seattle’s straw ban took effect this month, too). But humanity has a long way to go. Straws are the tip of the plastic iceberg, which runs from heart valves to bicycle helmets, product packaging, smartphone cases and much, much more. “Life, today, doesn’t happen without plastic materials,” according to a promotional page of the Plastics Industry Association, a trade and industry advocacy group. It maintains that the problem isn’t plastics but littering. Plastics is very big business. The industry employed about 965,000 in the U.S in 2016. It shipped $404 billion worth of materials. If anything, this understates the power of plastics, because they are embedded in virtually all supply chains. The trouble is that discarded plastic finds its way into the environment, and it’s more than an eyesore. The Ocean Conservancy, which claims its volunteers have picked up 9 million straws on beaches and beside waterways, says too many end up in the ocean. There, they endanger wildlife, along with valuable fisheries. Recyclers have a hard time handling them because of their small size. Nearly 2 trillion pieces of plastic are in the Great Pacific Garbage Patch, the notorious larger-than-Texas floating dump. (It was named by Seattle oceanographer Curtis Ebbesmeyer). A new study of the gyre, published in the journal Scientific Reports, concluded that 46 percent of its mass comes from fishing gear, lost or discarded. Microplastics made up only 8 percent of the total mass but 94 percent of the floating pieces. Plastics bring other environmental problems, including from their long life and toxic breakup. Plastics depend on petrochemicals for manufacturing, adding to greenhouse gases that are a primary cause of climate change. Yet constructive responses are slow to come. Red states even prohibit their blue cities from enacting plastic-bag bans. The plastic industry is mighty, with lobbying money, elite lawyers, shareholders and a good story to tell (if one doesn’t look too deep). The ocean is mostly an unregulated expanse, where all may pollute without charge but none (or few) are responsible for its preservation. Rising plastics pollution is also what economists call an “externality.” In this case, the cost of plastic pollution is spread out to all of society. Revenues, profits and share prices are easily counted. Externalities are not. Profits are privatized, costs are socialized. Only effective regulation and enforcement can counter these ills. But with the regressive policies of the Other Washington, the task falls imperfectly to states, other countries and enlightened corporations. So Starbucks is taking a first sip. But we have oceans to go.